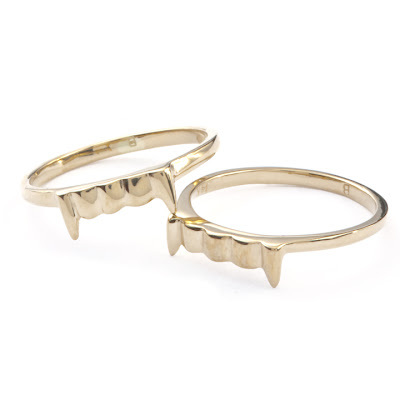 A pair of interlocking baby vamp rings from Bittersweets NY. I'm kind of geeking out about how romantic that is. I'm concerned the werewolves might throw a fit if you got them in silver. Just saying. awesome. i want one just 'cause. I think Sookie and Bill should have those, for sure. dark and disturbing. LOVE. great find! i'm over the vampire thing. don't get me wrong. the rings are way cool. but if i wore them, my students would start shrieking about twilight and asking me if i think edward is dreamy.